Are you happy about when you can get an appointment at your practice? Would you like to use GP services locally at the weekends? How do you feel about travelling to another local practice to receive care at the weekend? These are some of the questions we’d love to hear your answers to. 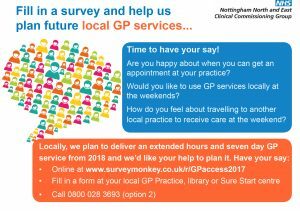 Your feedback can help us improve GP services across Nottingham North and East. In line with NHS England’s ‘General Practice Forward View’, which was published in April 2016, we are working towards implementing extended hours and seven day local GP services across the Nottingham North and East area during 2018/19. To support this, and to ensure we deliver the services you need, we will be carrying out engagement activities with local people throughout the Summer period to establish what you want from an extended GP service and to look at ways we can further improve access. We know that extended hours are important to patients and we hope that, through working with GP Practices and local people, we can deliver the right local service for patients. We are running this engagement campaign across Nottingham North and East from Sunday 18 June to Monday 21 August.